Anyone that has worked in retail knows the perks of the employee discount. I worked for a clothing retailer for 10 years and I took full advantage of the employee discount which left us with lots of jeans! We are definitely a jeans family. Sometimes I wear dresses when it’s warm, but living in Utah means we have many months of cold weather so I mostly wear jeans. As my style and size changed over the years, I was left with lots of jeans that I didn’t want to wear so I needed to find a way to upcycle them. Once you become a mom of toddlers, you quickly learned how amazing parks and picnics are for saving your sanity. Seriously, a park provides hours of fun for the kids while mom gets to relax in the shade having a conversation with other adults. It’s the best thing ever. Then you get to take your tired kids home where they are no longer bouncing off the walls. So as soon as the sun starts shining, we put on our jackets and hit the parks. The only problem is, there are very few benches at the parks around here. Definitely not enough for the amount of parents there. So I started taking a blanket with me, but the damp grass quickly seeped through the blanket. With all those old jeans piling up in my craft room, I knew I could make the perfect picnic blanket and I did! The denim is super sturdy and holds up so great! I actually made this quilt a couple years ago and we’ve taken it camping in the dirt and rocks, to the park, and even to the beach and it still looks great. I also made sure to include some pockets from the jeans sprinkled all around the blanket. Just like in my easy picnic placemats with napkin pocket, the pockets are great for holding your napkin or anything else the wind might blow away. They come in very handy with little kids around. Then to really make this the best picnic blanket ever, I used a shower curtain liner on the back to make the whole picnic blanket water-resistant. 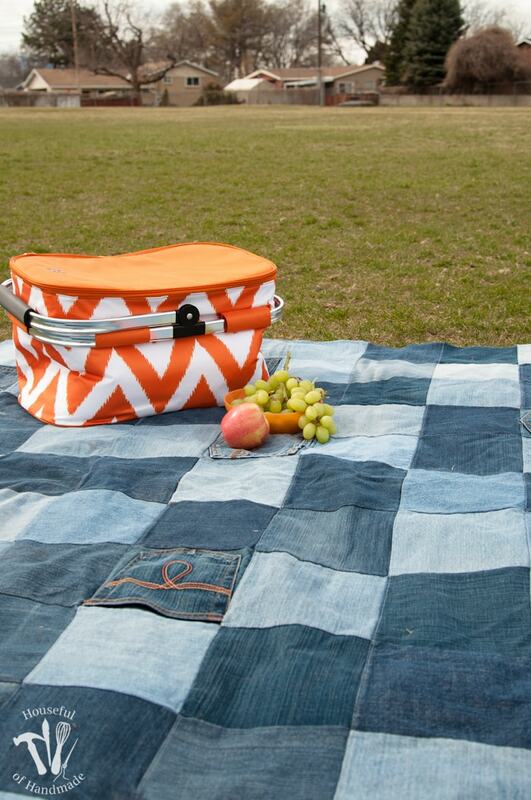 The result is this totally awesome water-resistant upcycled jeans picnic blanket and we absolutely love it! I would like to know how you joined your top and bottom. Did you use a binding? Nope, I just placed the two pieces right sides facing in, and sewed around the outside (all but about 10 inches). Then I turned it and top-sewed close to the edge to give it more strength as well as close up the opening left to turn it. Super easy and no binging needed! Then I quilted it after. A canvas painters drop cloth can be used in place of a shower curtain. They are waterproof and just a bit heavier. These can be purchased at Lowe’s and Home Depot in their paint department for a reasonable price. That is a great idea, no clue why I didn’t think of it because I love crafting with drop cloth. So is the shower curtain plastic Final type or it is a fabric shower curtain? How easy is it to launder? Sorry, I meant to say is the shower curtain vinyl as in some type of plastic or is it a fabric shower curtain? Cindy, it is a fabric curtain, but has a kind of finish on it to make it water resistant so it’s extra stiff. I have been tossing it in the washing machine and dryer every few weeks (during the summer) for 4 years now and it looks great. There is one part of the shower curtain that has a small rip in it. But it’s on the outer edges so it doesnt effect the water resistance much. A waterproofing spray could work. I haven’t had any issues with my shower curtain liner cracking and we have been using it lots for the past 4 years. If I missed info about this I’m sorry. I want to make one of these blankets but the only fabric shower curtains I can find say to hang to dry. Is it ok to put them in the dryer? I do not remember if mine said to hang dry or not, but I have always put my shower curtain liners in the dryer. I would recommend pre-washing it in case it shrinks a little. Do you have any tips for sewing through vinyl? I’m a beginning quilter and am hoping to make a quilt with vintage sheets and a vinyl backing. Thanks! For vinyl, if you put a piece of scotch tape on the underside of your pressure foot, it will help it to slip and not stick to the foot as much. Also, loosen the pressure of the foot to allow it to slide. And make sure to extend your stitch length. Most sewing machines have a default stitch length of 2.5 and it can cause the vinyl to rip because it’s close. Extend to about 3.5 to give you some more space between the holes made by the needle. I also suggest trying things on scrap pieces to make sure it is how you want before using it on your beautiful vintage sheets. Good luck! If you have a walking foot for your machine, that might help as well. Hello from Tasmania, Australia. 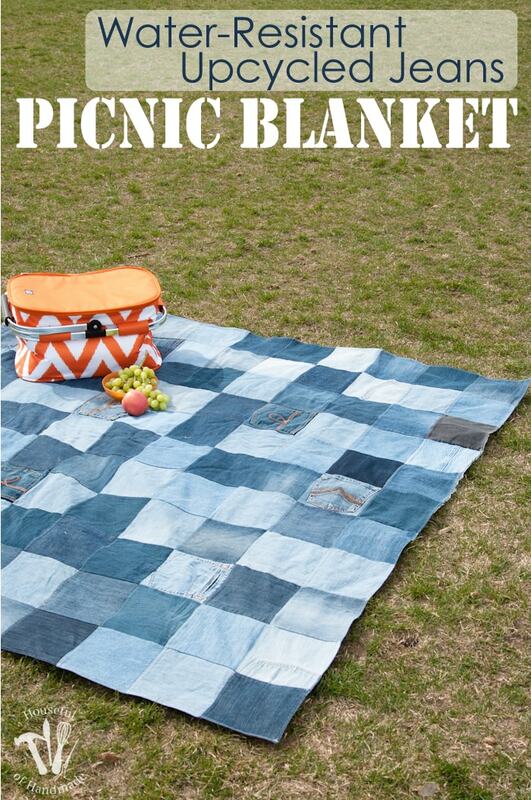 I’m loving the denim picnic blanket. purchase extra jeans at cheap prices. I will add the project to my “to do” list. Thanks for the great tutorial and loved reading other the comments. Thank you Jane! Good luck with two teenage daughters driving ;). These picnic blankets would be great for having in the car. They are heavy and water-resistant so in an emergency they can help with warmth, but then you can also use them for concerts and parks too! I hope you can get enough jeans soon. Or you could ask friends or family to save/give their unwanted jeans so you don’t have to buy any. Thanks Debby! You can do so much with the pocket pieces. They are super handy! Such a great idea for the backing! I’ve actually done the same thing apart from the backing! Right down to the exact size of squares you used. However, my issue is I’ve made it the size of a queen sized duvet (though it will be used for a picnic blanket) due to the fact that we have 4 in our family and like to have enough space to lay on it as well if we’re not having a picnic. Sadly I don’t think I can use a shower curtain liner for the backing due to the size. Grrr! It’s such a great idea. I might just have to go and buy a king size sheet or something to use for the back and just scotch guard the back of it. You could piece together a couple shower curtains to get the larger size, or even back it with oilcloth or other water-resistant fabric. The denim is definitely going to be awesome no matter how you back it! The trick is to extend your stitch length. At a standard 2.5 length it can perforate the shower curtain and make is more susceptible to tearing. Extended to a 3.5 will help. I haven’t had any problems with mine! Could you post a pic of what the back side of the blanket looks like? I love this idea. Rag quilts made from jean squares are awesome and easy to make too. You can also buy squares already cut on eBay for a pretty nice price. The rag quilt is a lot thicker and is pretty heavy. Precut squares would be awesome! Cutting is definitely my least favorite part of sewing quilts, but luckily my cutting square and rotary cutter makes it a little easier. 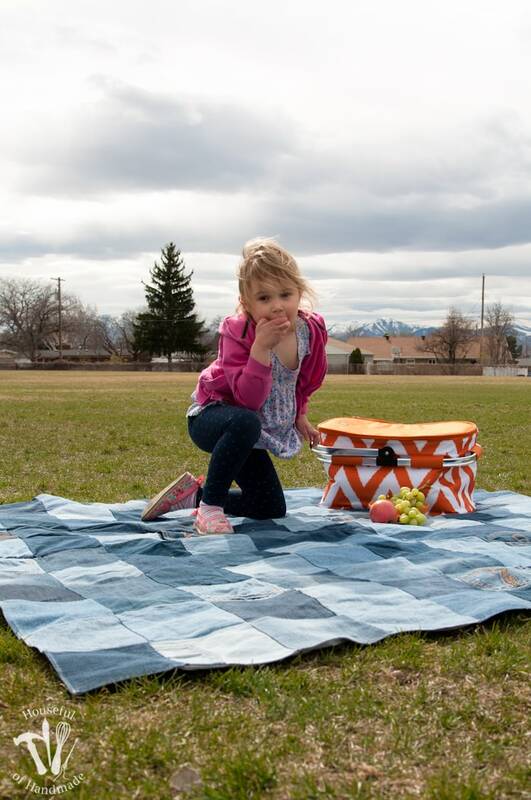 I chose not to do a rag quilt for the picnic blanket because my kids are messy and I knew they would end up getting food stuck in the exposed seams, but I have a few of them that we use for other purposes, they are great! I’ve made these using a “quillow” technique. Meaning, I sewed a huge pocket onto the end of the quilt, then I can fold it into its own pocket and it’s a pillow size for storage. Easy enough to add a couple handles to create a tote. I love the size of your patches. Thanks Pati. I have quillow that I made in high school! I keep it in the car for emergencies. It would work perfectly for this picnic blanket, but as of now, we just fold it up and put it in a reusable grocery tote. What a great idea! I’ve thought about a quilt as well, but that seems too overwhelming. Question: How do you store/carry it? All that denim could get a bit bulky. Have you considered designing/making a bag, also from recycled jeans, to keep it in? Perhaps using seams or waistbands for straps or closures? I have made similar blankets to take camping but I love that these are waterproof! Thanks for sharing at Merry Monday! Thank you Sara! The water-resistant back comes in very handy. Wow! This is such a creative way to use old jeans! I am always looking for new ways to reuse things that I already have on hand! I will definitely be adding this project to my list! Thanks Brittany! I love being able to reuse too. Thank you so much for the feature Lisa! Wow, what a clever way to use old jeans! Here in the NW, it’s important you have a water resistant blanket since it’s often wet 🙂 Thanks for sharing at Welcome Home Wednesdays! Appreciate you linking up. See you next week! Thanks Jenny! Isn’t that cooler awesome. Perfect for picnics. I’ve been saving old jeans for quite a while now and have a bag full. I had some sort of quilt in mind but I think this is probably a lot more practical. Your instructions are super clear, thanks, I feel very inspired! Thank you Julie! 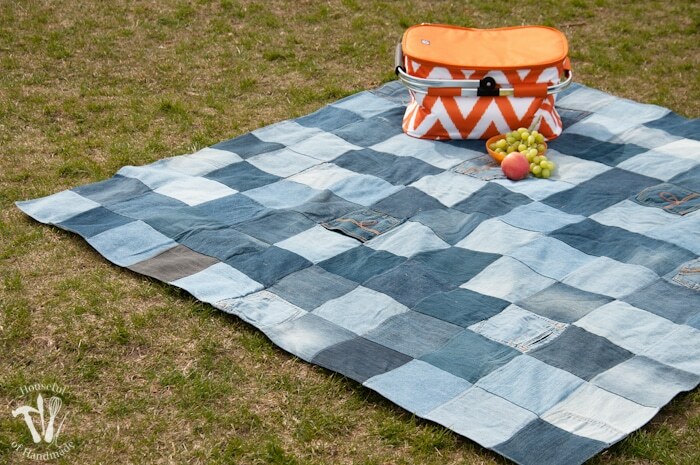 We love our picnic blanket quilt. This would be perfect for all our visits to the park this summer. Thanks for sharing! Thank you Charlene! I hope you get a chance to make one. Cute things like this make me wish I could sew! Love this idea, we sure could use one a lot in the summer time. What a great idea! This is super cute. I have a huge jean quilt, and not being water resistant was one of the things I dislike about it. I can’t wait to make another following this tip! Thank you! This is fabulous! What a great idea. Sue, it is a fabric sower curtain liner (polyester or nylon) but is coated with something to make it water-resistant. I wash it in my washing machine with cold water and tumble dry low. A plastic liner will tear because the sewing machine needle will perforate the seams and make them weak, but since this one is fabric it is a bit sturdier. There are a few small tears on the bottom since we’ve been using this quilt for 3 years now, but I don’t have any issues from them. I had the same question. Thanks for the swer! You’re welcome Cheryl 🙂 Let me know if you have any other questions. Yes Cynthia! I wash it very regularly. I have 2 kids and a dog so we put it through the test (and the blanket in the picture is 3 years old, we use it all the time and it still looks great). I just wash on cold water and tumble dry low. Love this quilt ! Did you use a plastic shower curtain or one of the fabric liner ones? Kerry, I used a fabric one (either polyester or nylon) but it is coated with something to make it water-resistant. I bought it at Walmart or Target for about $5. Be careful with plastic because the sewing machine needle will perforate it and make it rip easily. Ahh I love this idea! I’ve been wanting to take advantage of the nice Spring weather and go on a few picnics. This blanket is a great way to recycle old jeans! Thanks Jenna! You are definitely going to be needing one of these after you have your baby 🙂 Lots of park visits in your future. What a great way to reuse old jeans! We have a bunch of jeans that we no longer wear, and this would be such a great project for them. I love how you added the shower curtain liner to keep it water resistant. It turned out so cute! Thank you Celeste! I finally got rid of most of our old denim and we love our picnic blanket.